← Let your Valentine’s Day Gift Speak Volumes! As Graduation Day approaches, we can’t help but be excited for such a momentous and special moment! Whether it is your son, daughter, grandchild, friend, or anyone at all, we all know someone who is just about ready to receive that diploma! But, while we celebrate this great accomplishment, we also want to celebrate our graduate as they embark on their next greatest journey. Whether they are entering high school, going off to college, or joining the workforce, we want them to feel the support from their loved ones and to feel encouraged on achieving their next goals in life wherever they may be. 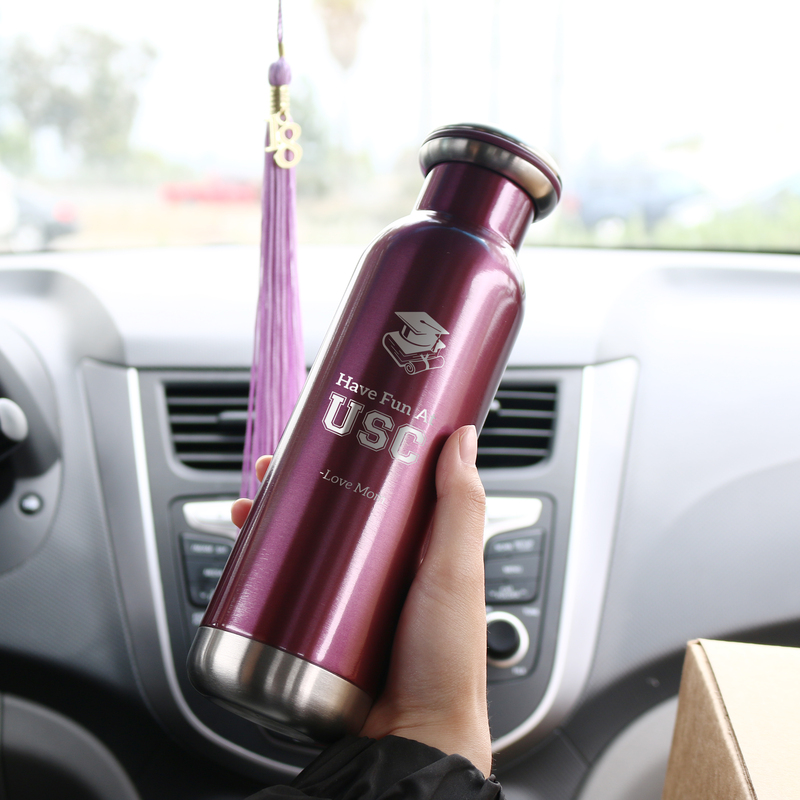 Here are just a few graduation gifts ideas that will give them a little piece of home…away from home! 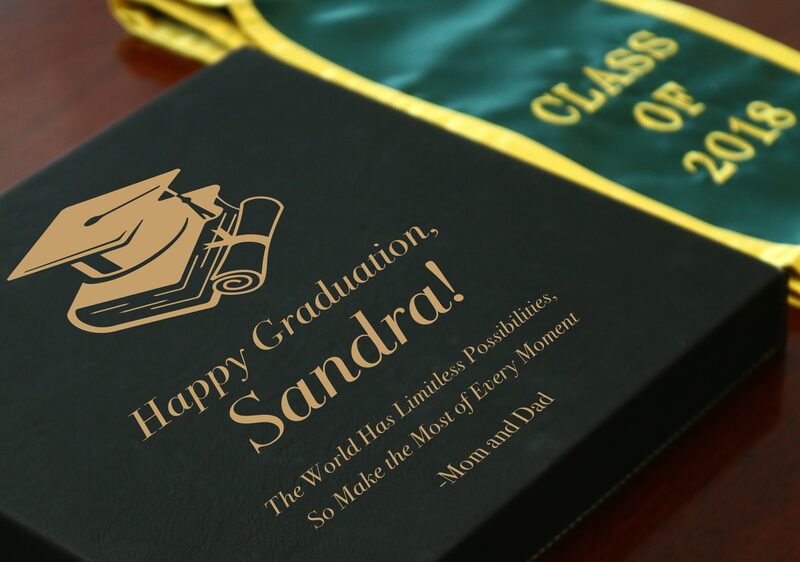 Give your graduate a personal gift that is both functional and long-lasting. The bq Bottle is built perfectly for traveling which can also keep your drinks cold or hot throughout the day. Make your recipient feel right at home with a special engraved message on it. It could be an inspirational quote or even an inside joke to keep them smiling. You can personalize it to your heart’s desire to make sure your recipient feel support and motivation at the gym, in a classroom, or wherever they may go! Wherever your recipient is going after Graduation Day, help them add a piece of home with room decor! Wall art is the best form of decor because it is expressive and can give a space personality and character. 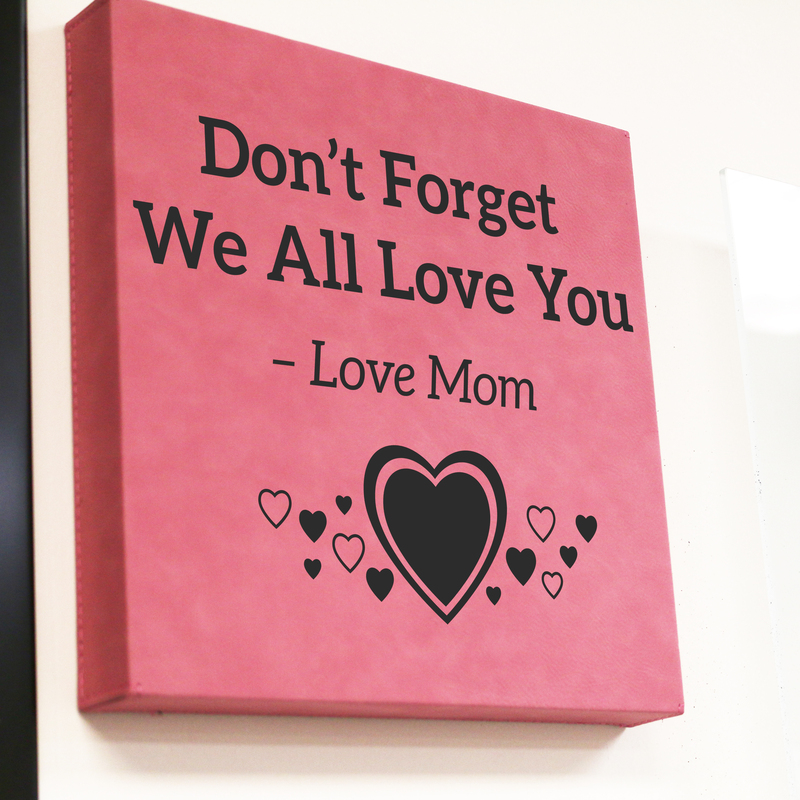 The greatest thing is that this wall art collection can be personalized to be anything you want it to be! Engrave on a special art design and any complimentary texts for your graduate to hang in their space. They will feel at home even if they are miles and miles away and they’ll never feel alone as long as they have this special piece of art. While one journey is ending, the next journey is just about to begin! We always want to encourage them to continue to work hard and pursue their dreams. 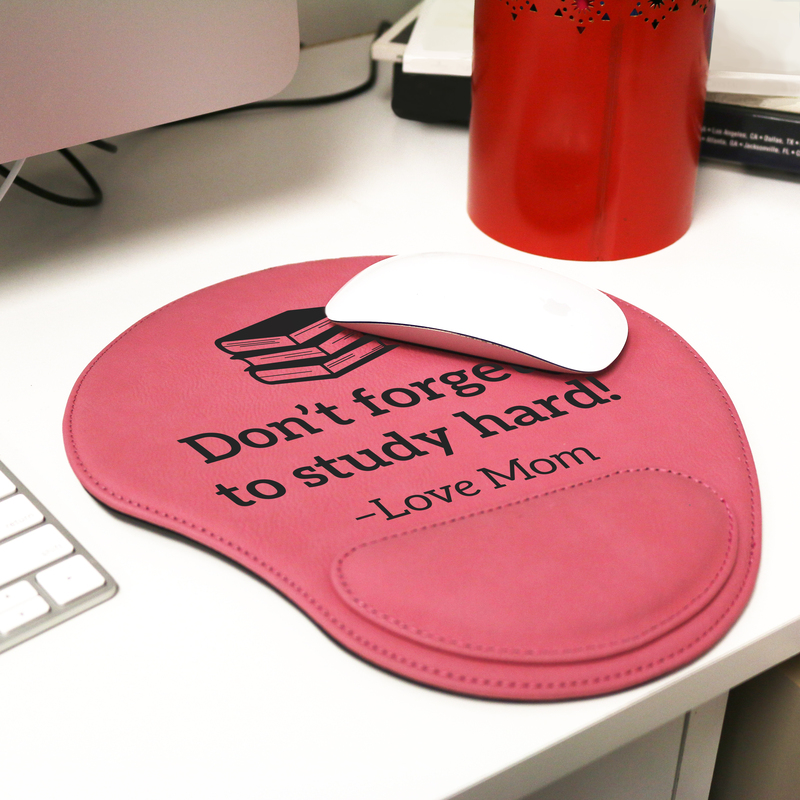 There is no better gift than office accessories like a mouse pad for their office at work or desk at home. Whether they are staying up late studying or building relationships with clients at work, a few words of encouragement can go a long way! You can engrave a positive quote or words of wisdom on the mouse pad, reminding them that their loved ones are supporting them and their endeavors every step of the way! Although we want to encourage our graduate to continue to reach their dreams, we also want to remind them to reward themselves along this long journey ahead. 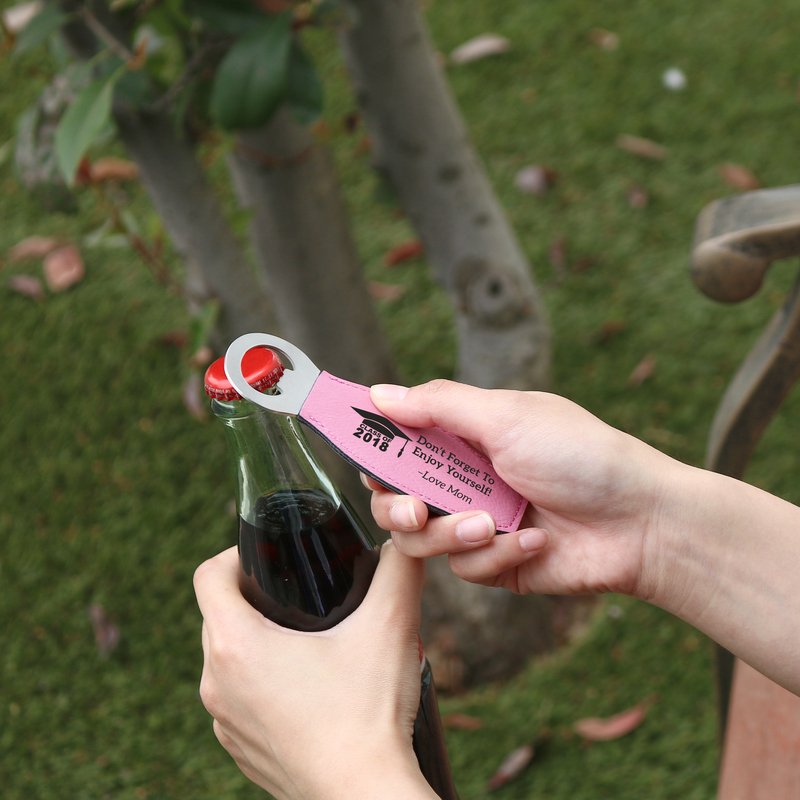 A personalized bottle opener is a great gift in times of relaxation. They can take it wherever they go so that it is readily available or even have it on their refrigerator door so it will never be lost in the house! You can personalize it with a little saying reminding them that it is okay to step away from responsibilities for a bit and to just relax and unwind. At the end of the day, Graduations are more than just a cap and gown; it is a beautiful reminder of the people you’re surrounded with and a reflection of who you are today. This overall meaning will guide you to be the person you will become and the accomplishments you will make in the future. So, make this moment unforgettable for years down the line and share these personal gifts with your graduate in celebration of this beautiful journey we call life! This entry was posted in CrystalPlus.com website, Etching, Importance of Recognition, Personalization and tagged appreciation, awards, class of 2018, engraved gifts, free engraving, gifts for her, gifts for high school. gifts for college, gifts for him, gifts for the office, graduation gifts, leather mouse pad, personalized bottle opener, personalized graduation gifts, personalized leather bottle opener, personalized leather wall art, personalized magnet bottle opener, personalized mouse pad, personalized office accessories, personalized wall art, personalized wall art canvas, personalized wall decor, personalized water bottle, recognition, travel accessories. Bookmark the permalink.